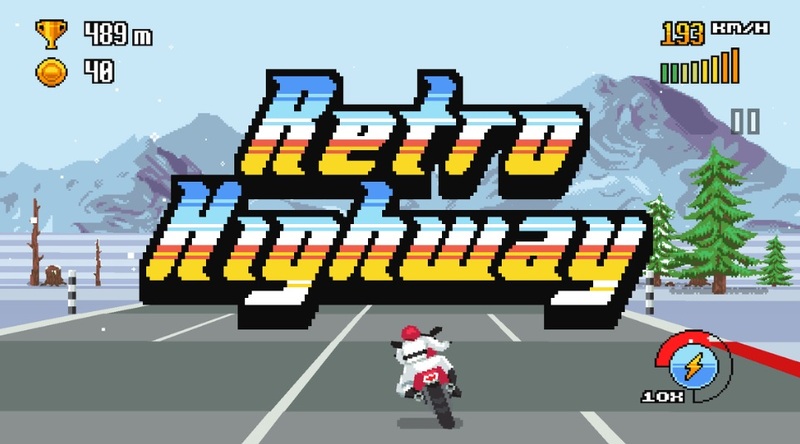 Developed by Dumb Luck Games, Retro Highway is, as you may have guessed, a retro style mobile game where you motorbike on busy streets. The goal is simple enough, drive for as long as you can and collect coins. It does not sound like much but make no mistake about it, Retro Highway is immersive. As you speed along the highway and collect coins, you have to avoid the other vehicles passing by. The longer you last and the more coins you collect the higher your point total. Doing tricks and stunts also boosts your score. There are only 3 buttons in the game, to steer your bike left or right, and another button for Nitro boost. All the buttons are onscreen so it is merely a matter of tapping the one you want to use. The Nitro button can only be activated once you have accumulated a certain number of points or performed stunts, however. Of course like most other mobile arcade games you can expect to die a few times. When that happens just tap “retry” and do it again. Another cool thing about Retro Highway is you get to keep all the Nitro you have gathered, so no need to start from square one. As you play the game and advance, you get the chance to unlock new motorbikes as well as new stages. The levels also have distinct themes that set them apart from the others plus new obstacles and other features. With its many features, re-playability and nice graphics, Retro Highway is certainly worth a try.